State-run Gujarat Gas Limited (GGL) has been granted permission to develop city gas distribution network (CGD) in Ahmedabad district. After having received a go-ahead for Amreli district, Gujarat Gas Ltd (GGL) has now received an authorization to develop city gas distribution (CGD) network in Dahej-Vagra taluka in Bharuch district. 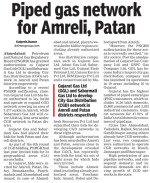 Gujarat Gas Ltd (GGL) and Sabarmati Gas Ltd to develop City Gas Distribution (CGD) network in Amreli and Patan districts respectively. The fall in gas prices and expanding distribution network will build margins and volumes respectively.